We offer a wide range of cashew nut tin filling machine that are very durable and widely reckoned for their sturdy construction. Available in customized options as per the technical specifications laid by our clients, these are offered at industry leading prices. We provide high quality cutting machines and tables that can be designed as per the specifications laid down by our clients. With the help of these machines one can cut the cashews by standing on the machine as well as sitting on the chair. The cutter machines consist of blades that are made of good quality metals. Apart from this there is also a facility of sharpening the blades of the cutter machine. 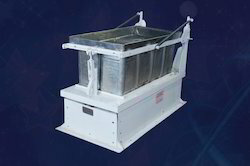 Around 40-60 cashew nuts can be cut by a well trained person per day with the help of this machine. Both hands and legs can be used for cutting the cashew nuts in this machine. Cashew nut can be cut by standing on a machine as well as by sitting on a chair. Hands and legs are useful in both the methods mentioned above. Blades of special metals are available. 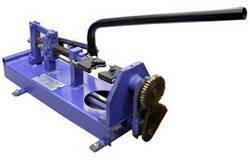 Facility of sharpening blades is also available. 40 to 60 k.g. Cashew nuts can be cut by a well trained person per day. 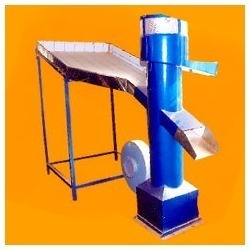 We have emerged as one of the reliable manufacturers of an excellent range of Cashew Nut Dust Cleaner Machines. Our range of products is manufactured using utmost quality raw material as per the global standards of eminence. Our team of experts deeply analyzes the entire production on various parameters to ensure that we are providing our customers flawless range. Further, our range is highly acknowledged for its salient features like resistance to corrosion, high strength, supreme quality, durability and reliability, etc. Looking for Filling And Cutting Machines ?